Since 1981, I've worked extremely hard to make a positive difference in the lives of my clients. Feedback from clients and other lawyers truly means the world to us. We invite you to carefully review our client, attorney and business associates testimonials. I believe that reading and listening to the thoughts and words of people that actually know me is a great way for you to get to know who I am. Although these words are about me, my focus is on you and serving your needs. View my video testimonials here. My father got into a trucking accident in the state of Ohio. Living a few states north, we went through many lawyers that made empty promises just to get our business and were unable to help. Everything changed once we found Anthony Castelli. He is by far the best attorney I've met. I call him old school - where a simple handshake seals the deal. With that said, he does not cut corners. He will give you honest evaluation of your case take it or leave it. He has an AMAZING team that works extremely hard. He and his team treated us like family. Unlike other attorneys we had, Anthony's first priority was to make sure my father recover from the accident and heal. Since we live 500 miles away, Mr. Castelli and his team stayed in touch with us all the time. Mr. Castelli is a hard worker who truly cares about his clients. There were times I would get emails from him at 2 AM. Anthony and his team were able to get a nice settlement for my father and most important, opened his eyes to enjoy the future. From the bottom of my heart I'd like to THANK YOU and YOUR TEAM for all the hard work you've done on our challenging case. If I ever need a lawyer in the state of Ohio, I know who to call. THANK YOU. ...who sincerely cares about his clients and goes the extra mile. He is honest, respectable and straightforward. He was recommended to me by many satisfied clients. The care and support you gave us was beyond anything we could have imagined. You found so much. you worked so diligently. Everytime you learned something new you called me. I did not feel like I was talking to an attorney I felt like I was talking to a friend. And that's what really helped us go through things. You've become a good friend and family member to all of us. Myself and my wife were injured in a serious car/truck collision. The trucking company disputed responsibility because they had a witness who claimed we were speeding as the truck turned right into our path. Tony thoroughly investigated our case and proved that the witness could not have determined that we were speeding as his vision would have been blocked by a pillar. He also found a witness that supported our case. We went through arbitration and were totally prepared by Tony to know what to expect every step of the way. His preparation and presentation was of the highest caliber. We got a very good verdict from the arbitration panel and because Tony was so convincing, the trucking company did not ask for a jury trial, but paid the award in full. ...in representing me as his client in my personal injury case in auto accident. I was on the business trip in Cincinnati, OH when it happened. I live in Washington State, so all the work and communication was done by phone, email and regular mail. 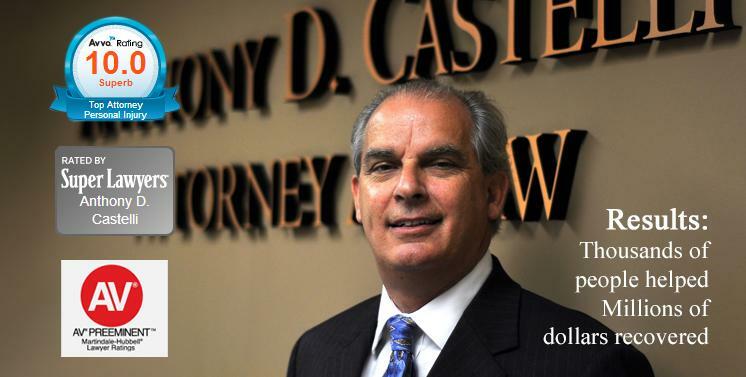 Not once I had a doubt or felt uncertain about Anthony D. Castelli handling the case. I appreciate all the work that he did. Anthony always kept in touch with me, keeping me up to date in all the processes. I truly appreciate his professionalism, extensive knowledge and experience in dealing with my case. I am pleased that I have chosen Anthony D. Castelli as my attorney. Anthony made me feel cared for when I put my trust in him. The resulting settlement was more than I was hoping for. I strongly recommend Anthony D. Castelli. I wish you success in all your work, Anthony. Thank you for being there for me. My family and I experienced a terrible trauma when my husband died as a result of a ski lift incident. Because the laws are written to protect the ski resorts, no one wanted to take the case. Mr. Castelli was brave enough to take it. He felt that "something was just not right!" He was diligent in gathering evidence. Because of his hard work, we prevailed. The jury found the ski resort negligent. This result will not bring back our "husband, father, grandfather" or ease the pain of his loss. After 4½ years, we still feel the pain, but a significant settlement can ease our burden and make the ski resort responsible for negligence. It made them take notice of how serious we were to prove it wasn't the victim's fault. I would just like to say my experience with Anthony Castelli was absolutely, positively, the best! I was injured in a motorcycle accident and didn't want to have to go through all of the hassle you have to do with insurance companies. I would highly recommend Anthony Castelli to be your lawyer. He answered and helped me through an awful time and I am very grateful! Thank you Again! Your office has been nothing but good to us! I was kind of lost after I got hurt. I did not know what to do. He took over and helped me out a lot. With the compensation I got I was really happy. 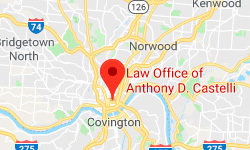 If you have a personal injury to definitely want to see Tony Castelli. He's like family to me. He was in constant contact with me and my father regardless whether it was day or night. He always had time to pick up the phone and call us. Tony provided excellent service I new I couldn't fight with the insurance and that's why I turned it over to Tony. Tony is definitely someone you want on your side. He is as genuine as they come...and I don't say that about many attorneys. As a videographer I have worked with Tony on multiple personal injury and wrongful death cases. He has used video as evidence to show how a tripping defect that caused a severe ankle fracture was not visible at night. He has used my video services to portray a families' terrible pain due to the loss of a son. He is genuinely concerned about his clients and wants the insurance company to see the emotional toll his client's deal with. He connects with his clients on a personal level and treats them with genuine compassion. Tony is a very knowledgeable attorney who treats his clients with respect! He has gotten me numerous awards in Workers Comp and won my Social Security Disability claim as well!! Got me a great result! Tony really looks out for your best interest. I would for sure recommend his services. Anthony is a great Personal Injury Lawyer who always puts his clients first! He fights to get his clients the settlement they deserve! Mr. Castelli has the experience to handle all types of personal injury claims. He is well respected in the legal community and appreciated by his clients.